You are thinking I need a website but are not sure about what information do I need to add to my website and you need some website content ideas. Below are a list of website page suggestions on what pages you may like to add to your new or outstanding website. The Home page is by far the most important page on a website. 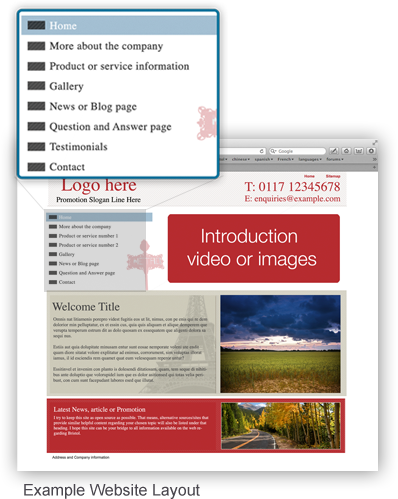 The viewer should be able to have a good idea of the service or product of the website within the first few seconds. The main title and images are very important. Ideally there shouldn't be too much text on the home page. Keeping the description short and concise is important. Any extra information can either be placed at the bottom of the home page or on an about page where you can give a much more detailed description. Sections of the home page could also include links to other parts of the website. For Example product promotions,latest news or service focal points. Here you can expand on from your home page. You could include images of and about the company and details of employees. If you have a video that promotes the company then that could also be placed here or the video could have it's own page. The goal of your home page is to entice your viewer to this page, So it's a good idea to highlight these areas on your home page and include several opportunities for people to click on these areas. You could also provide direct links to these pages when link building and using an email campaign. What you include on these pages will change from site to site but the importance is high so good product or service information is vital. Clear good quality images are a very good idea. Not applicable to all sites but here is a good opportunity to show off all your products or service images together. Some description text should also be included. Also images should be at a good quality in respect to colour and quality. News or a Blog page. A Blog or news feed that is regularly updated is a good idea if the updates are regular. At least once a month, otherwise this will not look good for your company as it will give the feeling your web site is out of date. The articles should also be helpful and informative stay away from too much self promotion. Using this method has many advantages one being an article that does well on the search engines could lead a large number of people to your web site. This is a great way to show of the praises that you have received from customers. You can also invite people on the page to submit testimonials. It is also a good idea to ask for testimonials on your email signature and also have a direct link to the page. Also it's a good idea to direct your customer to add their testimonials to local rating websites as well as sites like Google and Yellow pages. If you often get asked questions by your customers then you should add a Q&A page. Helpful for both the customer and search engines. You can also have an option at the bottom of the page for people to email questions that don't already exist on the page. Include your full business address, local land line phone number and contact email addresses. An on-line contact form for both people who don't have access to an email or at a location where they do not have access to their own email is an option. You could also include location images and a Google map.